* Come and see us if they have any questions or worries. As a parent or guardian, how can I help with my child’s learning? All the fun activities that you do with your child at home are important in supporting their learning and development, and have a really long lasting effect on your child’s learning as they progress through school. When your child leaves school, please talk to them about their day. 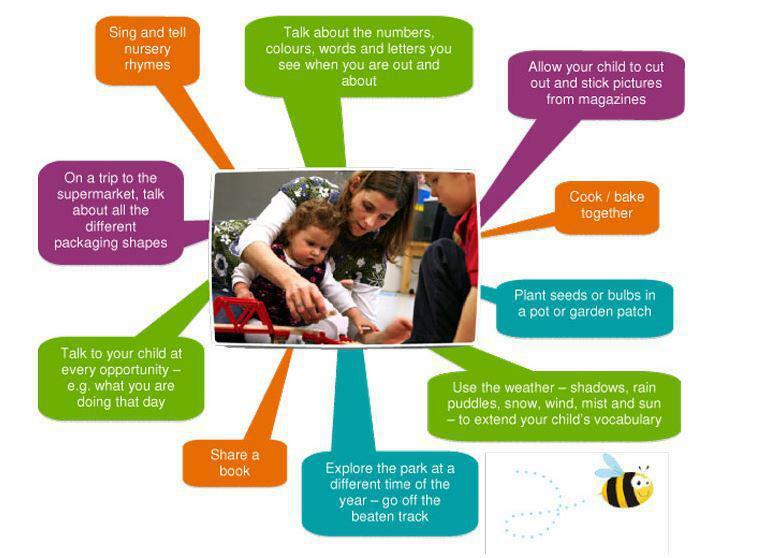 If you make the time every day to do some of the following things with your child it will make a real difference to your child’s confidence as a young learner. READ WRITE INC LAUNCH AMAZING NEW YOUTUBE CHANNEL! This link will take you to a fabulous selection of videos to give you all of the information you need to understand phonics and the Read Write Inc programme that we use in school. See below for an example video. Just click and go! ​Fred is a frog who can say and read words only as pure sounds. He cannot say whole words. The team at Read Write Inc phonics have put together some 'Fred Games' for parents to use to support their children when they are learning how to blend sounds together to build words. Click below to watch the video and to read the PDF leaflet for more Fred Talk ideas. Learn how to pronounce pure sounds from Set 1 sounds, through to Set 3 sounds with the help of 5-year old Sylvie. Click on the link below to watch the video. Story time at home: an essential part of your child's reading journey. Click on the link below to watch the video.